I always look forward to March as the start of our family’s birthdays for the year. The last is in August, so there’s quite a long dry stretch between the end of one year’s birthdays and the start of the next birthday season. But as I mentioned in my last post, we have two in March, and they are only eight days apparent, which catches us up on birthday festivities in the breathless space of a week. If you are a baker, there is nothing you like better than other people’s birthdays. Your own, no matter how lovely, can never be quite as much fun, because people will insist on making your cake for you. I admit that they are right, that the birthday boy or girl really ought not spend their special day closeted away by themselves in the kitchen; but I still find it hard to relinquish the birthday cake duties. I believe I’ve held forth on this topic before, but it bears repeating that an extravagant, gorgeous layer cake is one of the most exciting creations of the kitchen, and I am sorry to have to miss out on it even one time a year. 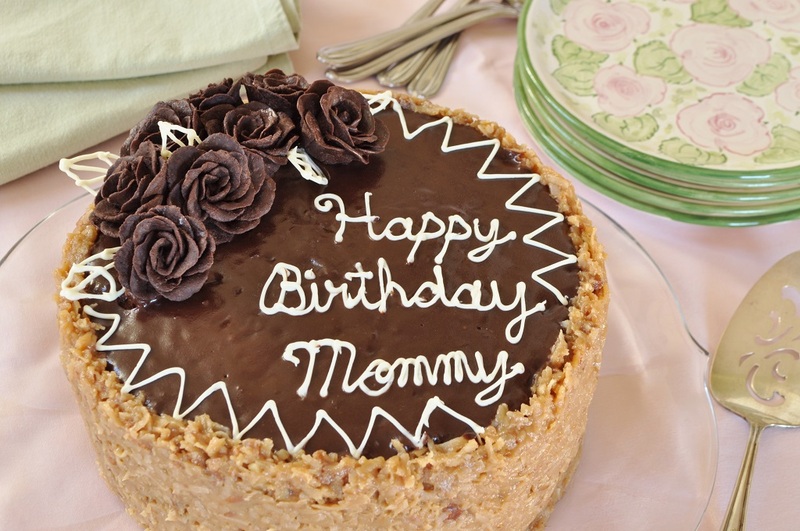 Of course, even if I could make my own birthday cake, it still would not be as special as making them for other people. The amount of labour and planning that goes into a celebratory cake is something that is best given as a gift. It would seem almost wrong to lavish so much time and care on yourself. But on other people’s birthdays, we bakers can throw ourselves into the task wholeheartedly. 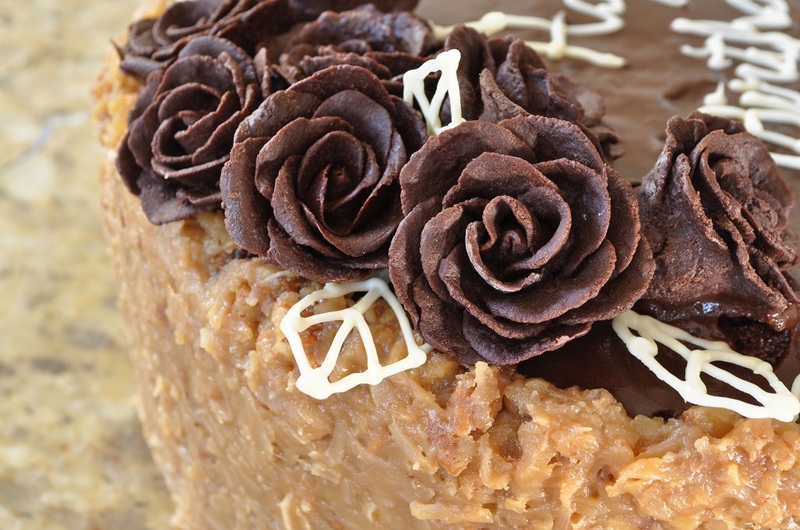 This year, I made my mother (she’s the first birthday) a German chocolate cake, which, with three layers of cake, two decadent frostings, and a bouquet of hand-molded chocolate roses for decoration, is certainly a showstopper of a cake. 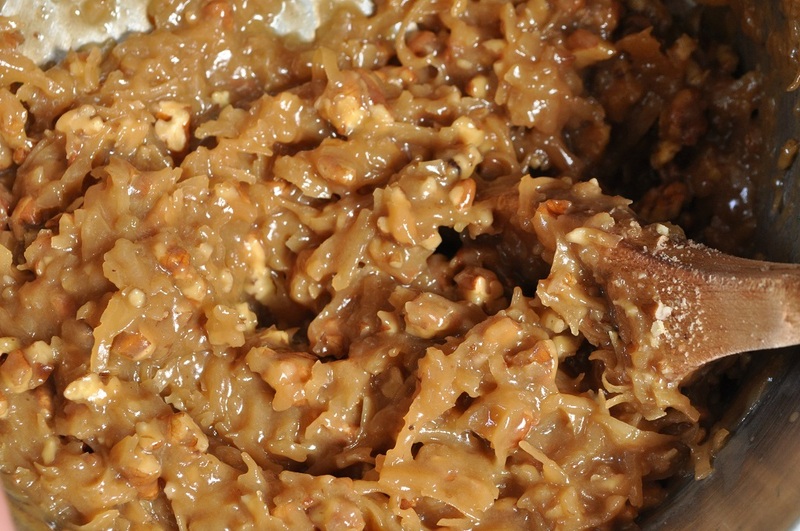 German chocolate has always been one of my family’s favourite choices for birthdays (possibly because it is so rich that no other event seems like a sufficient excuse for such indulgence), but I haven’t been able to make one for my mother in a long time, due to her egg allergy. 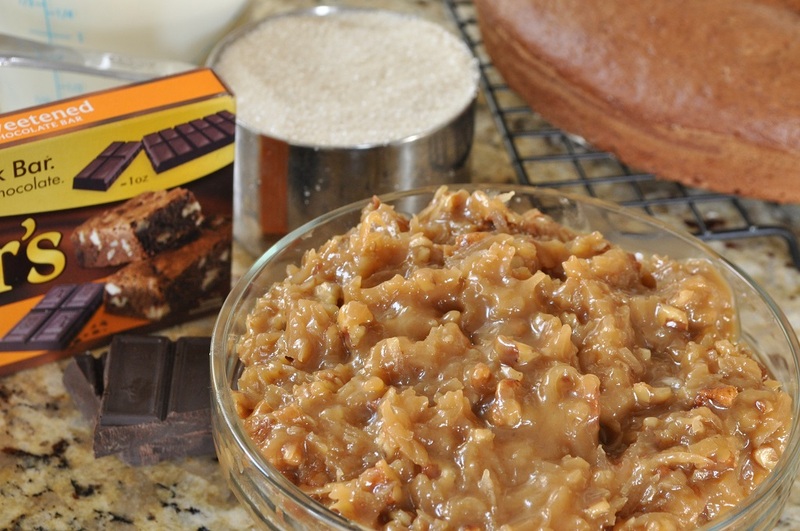 But this year, I decided that it was time to finally end the German chocolate cake dilemma and make an eggless version. The changes were perfectly simple and the final result so indistinguishable from the original version that I wonder why I put it off so long. However, I think it is safe to say that the final result was decadent and impressive enough to make up for those few years of deprivation. 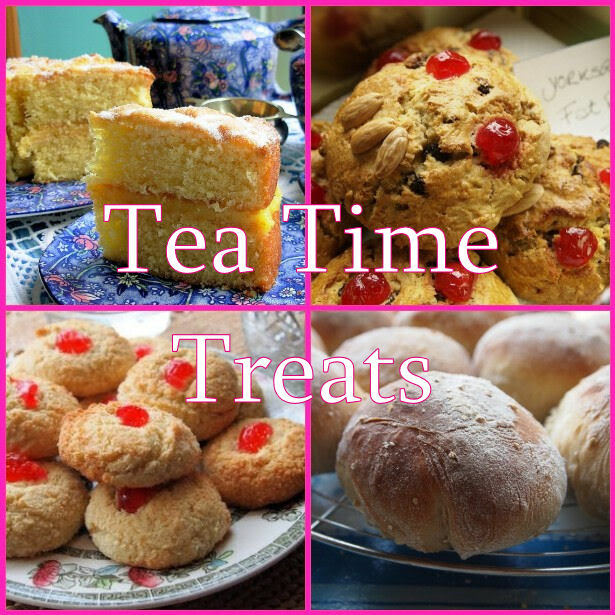 And by the most wonderful luck, Jane of The Hedgecombers has picked decorated cakes as the theme for this month’s Tea Time Treats. 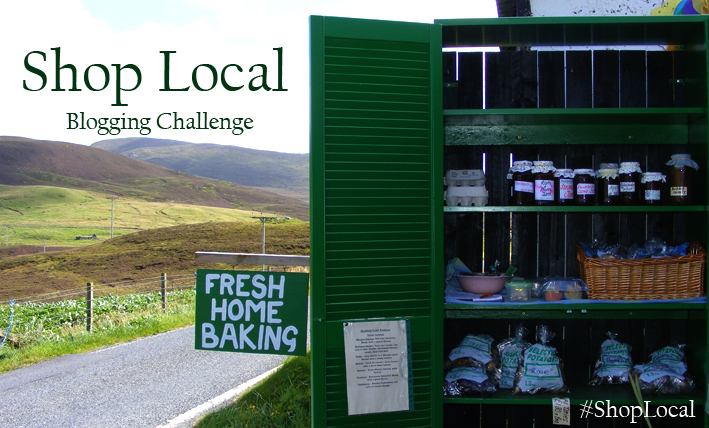 Jane and Karen of Lavender and Lovage co-host this challenge, and I am delighted to be able to link this cake up with Tea Time Treats. I am also submitting it to the We Should Cocoa challenge, which is organized by Choclette of Chocolate Log Blog. This month Laura of I’d Much Rather Bake Than . . . is hosting the challenge, and she selected coconut as the ingredient to pair with chocolate. 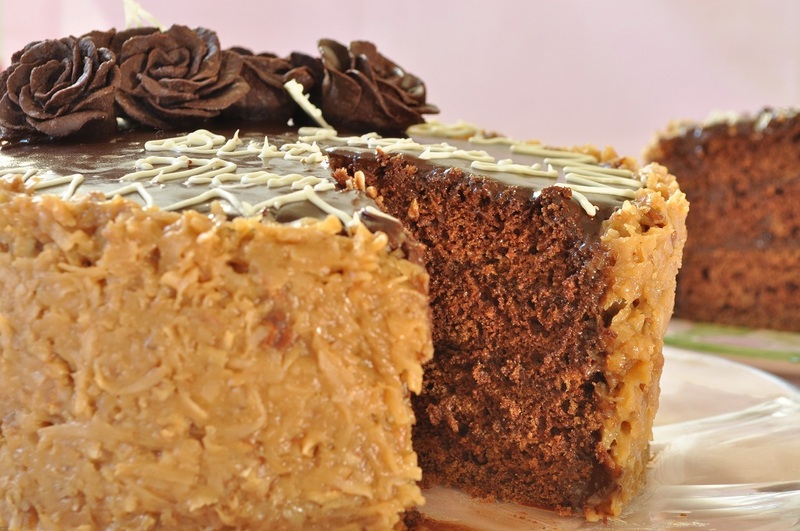 As all lovers of German chocolate cake know, it is the combination of fudge and coconut frostings that make this cake so irresistible . . . Finally, I’m linking up with the Shop Local challenge from Elizabeth of Elizabeth’s Kitchen Diary—for the second time this month! I used local buttermilk for the cake, which is much more delicious than the ultra-pasteurized kind they sell at the supermarkets. I love the mission of Shop Local, promoting local foods, and am thrilled to be linking up twice this month. The décor chocolate has to be made a night in advance. 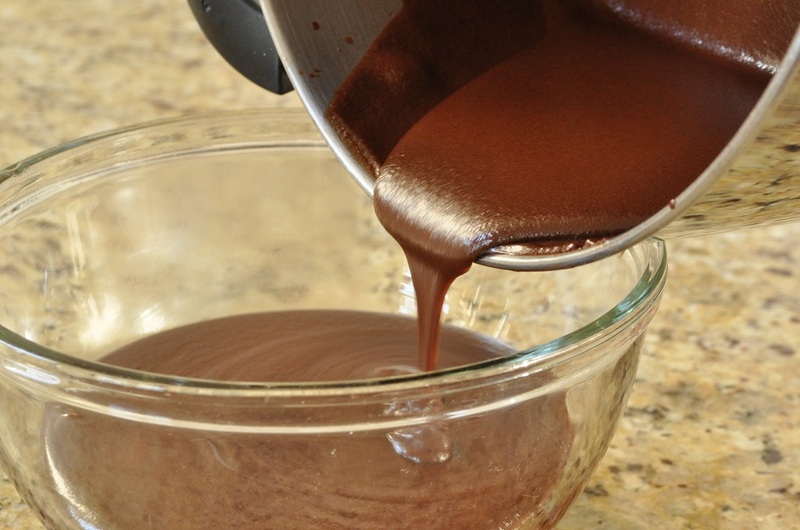 Melt the couverture chocolate over a double boiler and then stir in the corn syrup. Pour the mixture into a bowl lined with plastic wrap. Cover and let set overnight. The next day, dip the bottom of the bowl in hot water for a minute or two and then use the plastic wrap to help you lift the hardened décor chocolate out of the bowl. If not using right away, wrap the disc of décor chocolate first in wax paper and then in plastic wrap, and store it in a cool place. It can be made several days in advance. The cake layers can also be made the night before. Line three 9-inch round cake pans with parchment paper. Grease and flour the sides of the pans. Preheat the oven to 350°F. In a large bowl, cream together the brown sugar and butter. Beat in almost all of the buttermilk, reserving a few tablespoons. Add the vanilla. Sift together the flour and cocoa powder. Stir into the wet mixture and beat until smooth. 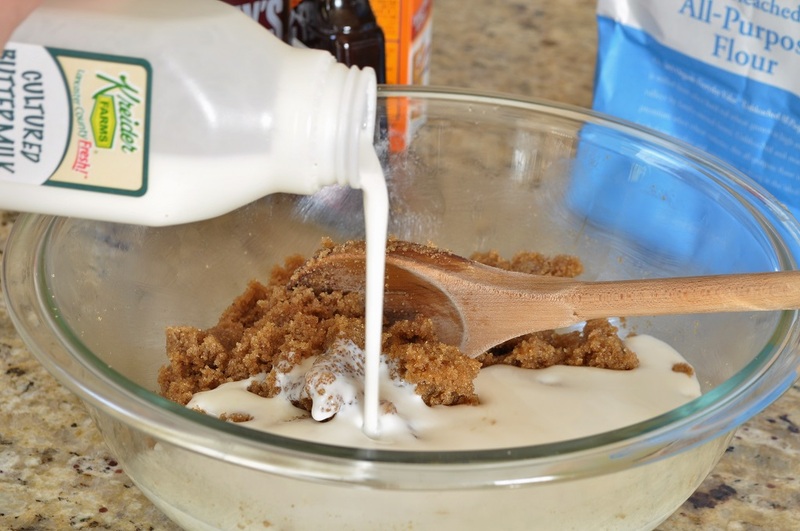 Dissolve the baking soda in the reserved buttermilk and then quickly mix into the cake batter. Divide the batter evenly among the three prepared pans. Bake until a toothpick inserted in the center of a cake comes out clean, about 25 minutes. Cool in pans on wire racks. If you make the cakes the night before, let them cool completely before removing them from the pans and wrapping them tightly in plastic wrap. 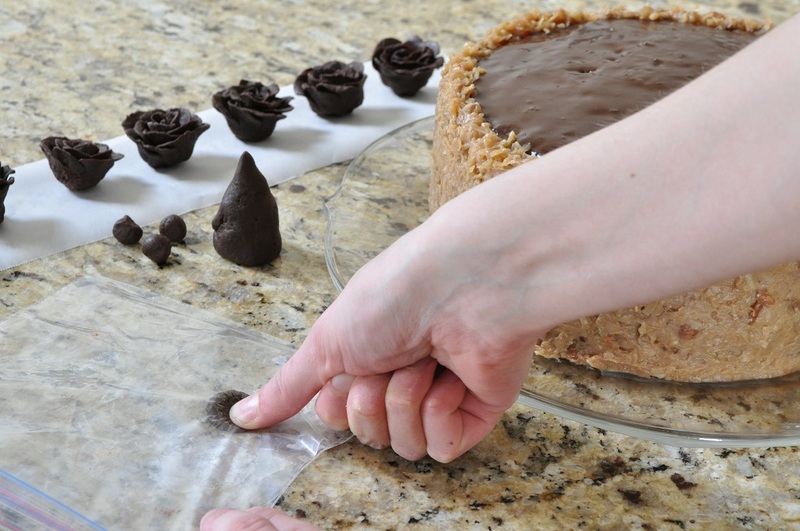 Leave the parchment paper discs on the bottom of the cakes though, as this will help keep them from drying out. 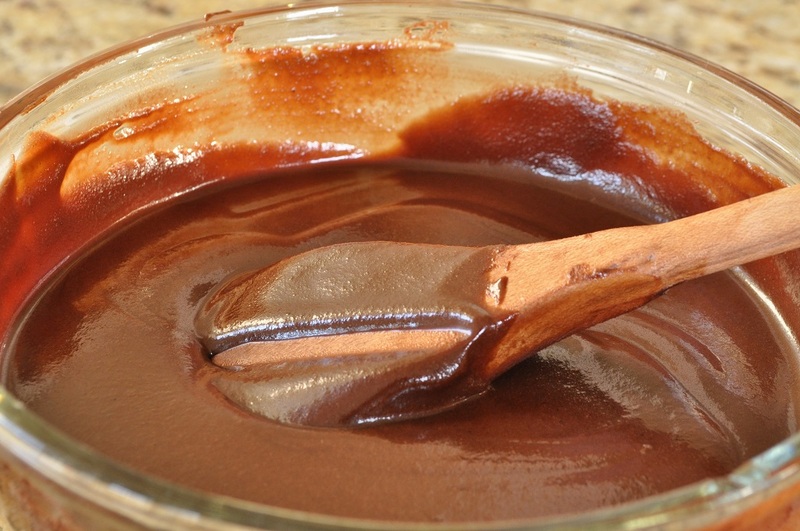 For the fudge icing, combine the chopped chocolate, sugar, and milk in a large, heavy-bottomed saucepan. Bring to a boil and cook, stirring frequently, until the mixture is thick and creamy, 30-35 minutes. Pour into a bowl and let cool completely. You can speed up the process by nestling the bowl of icing in a larger bowl filled with ice water. However, the icing will remain quite loose, even after it is fully chilled. 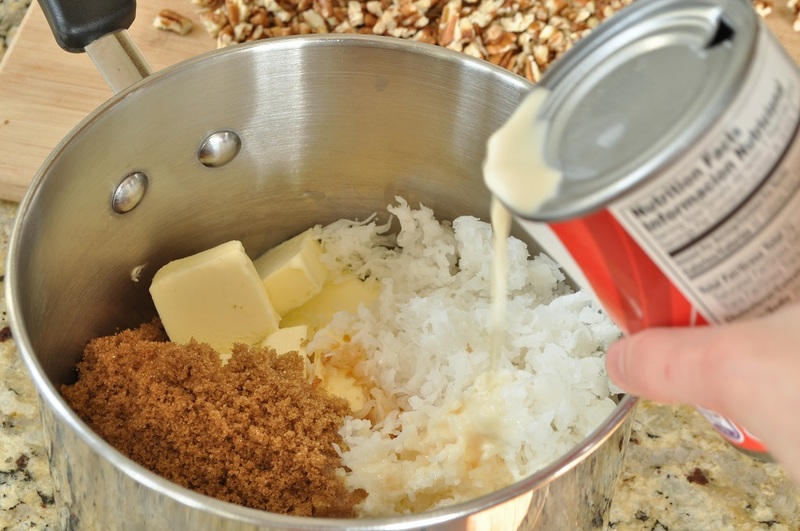 For the coconut-pecan frosting, combine the evaporated milk, butter, sugar, and vanilla in a medium saucepan and bring to a boil. Turn down the heat to medium and continue to cook, stirring frequently, until the mixture is thick and glossy, 12-15 minutes. 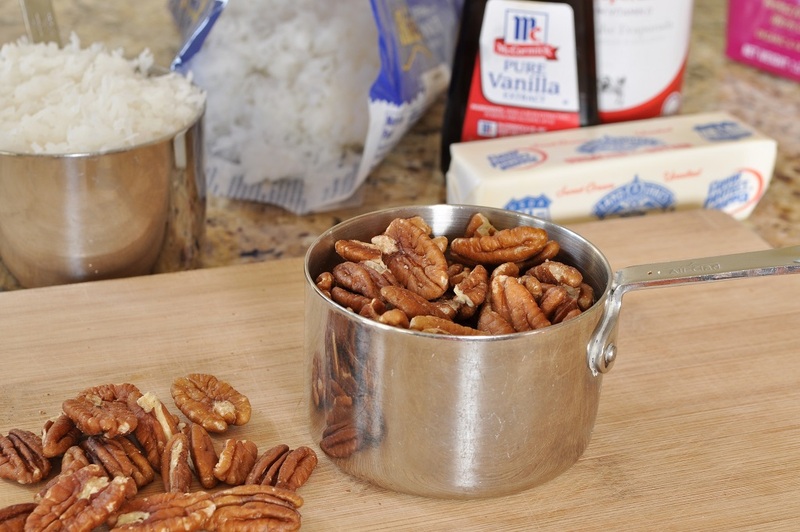 Remove from heat, stir in the coconut and pecans, and pour the frosting into a bowl. Don’t chill this one before you use it, as it does thicken up considerably and will become hard to spread. Furthermore, since it has no eggs in it, you really don’t need to be concerned about keeping this frosting refrigerated. Now that you have all your components prepared, you can start assembling the cake and decorations. 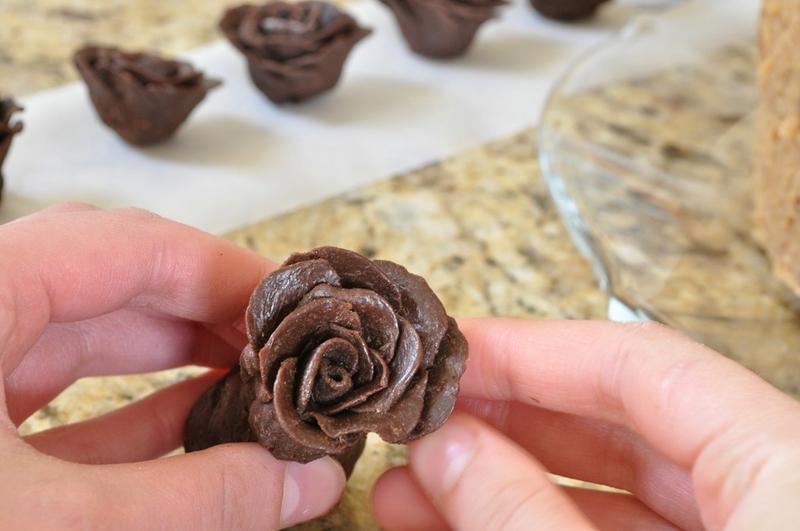 When you are ready to make your chocolate roses, unwrap the décor chocolate and knead it until it is smooth and pliable on a surface dusted with cornstarch. 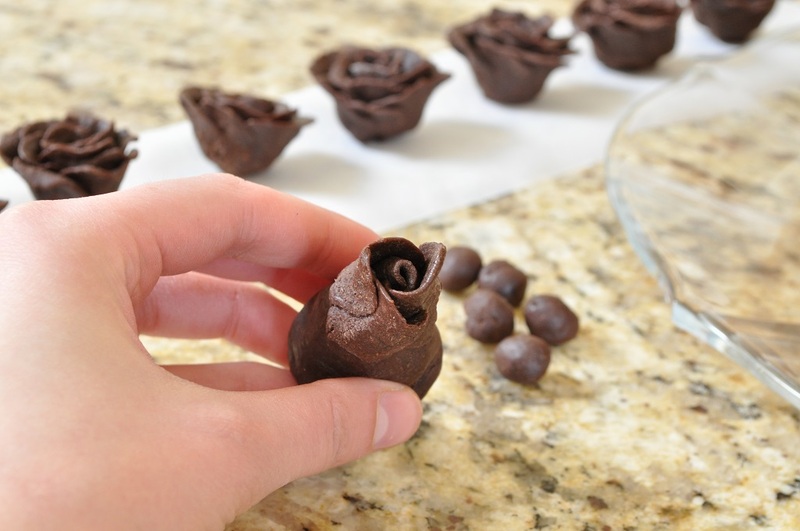 To mold a rose, take a golf ball-sized piece of the chocolate and shape it into a cone. Then pinch off hazelnut-sized pieces of the chocolate and roll them into balls. You will need 16 of these balls to make a full-blown rose, 9 to make a half-blown rose, and 4 to make a bud. Take a ziplock bag and cut it along the two short sides so that it can open like a book. Place one of the balls of chocolate between the two “pages” and use your thumb to flatten the ball slightly. Then slide your thumb to the right and continue to further flatten one side of the ball, pushing the chocolate into a rounded, fan-like shape. Repeat for all the remaining petals. To assemble a rose, take one petal and wrap it snugly around the point of the cone you made earlier, making sure that the two sides reach all the way around and overlap each other. Take another petal and press its base into the cone, at a level where the top of the petal is even with the point of the cone. Push the left side of the petal gently against the cone to attach it. Place the next petal so that it partially overlaps the attached side of the first petal. For the third and final petal of the first row, space it so that it overlaps the second petal on one side and is tucked under the unattached side of the first petal on the other. Gently press the unattached side of the petal in so that it joins the third petal. The first row is complete. If you want to make rosebuds, stop here. To make the second row, you follow the exact same procedure except you use five petals instead of three. You should also angle the petals so that they tilt out slightly. Still keep the top of each petal at the level of the cone tip though. If you attach the petals further down on the cone, it will spoil the appearance of the rose. 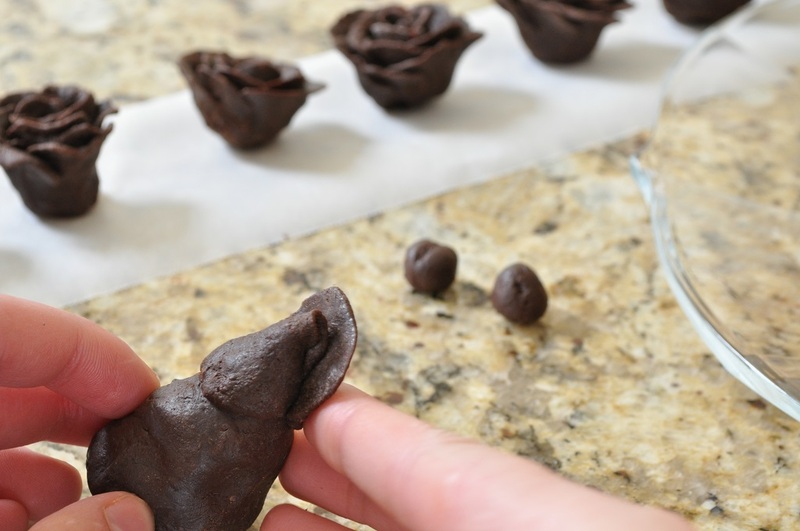 If you want to go all the way and make a full-blown rose, you repeat the process again using seven petals. Once you have all the petals on, press the bottoms of the petals firmly into the cone and pinch off the excess. This will pull open the petals and make the rose look more natural. 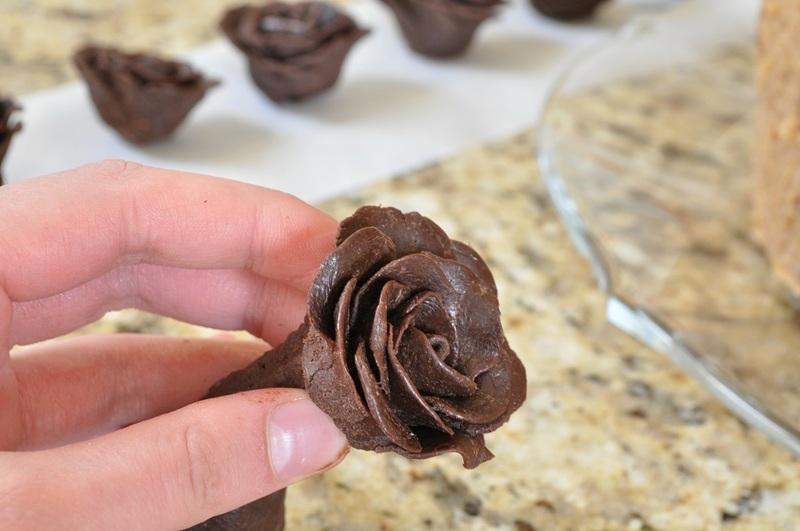 You can also tweak and ruffle the edges of the petals to suit you, but don’t handle them too roughly as they can tear. 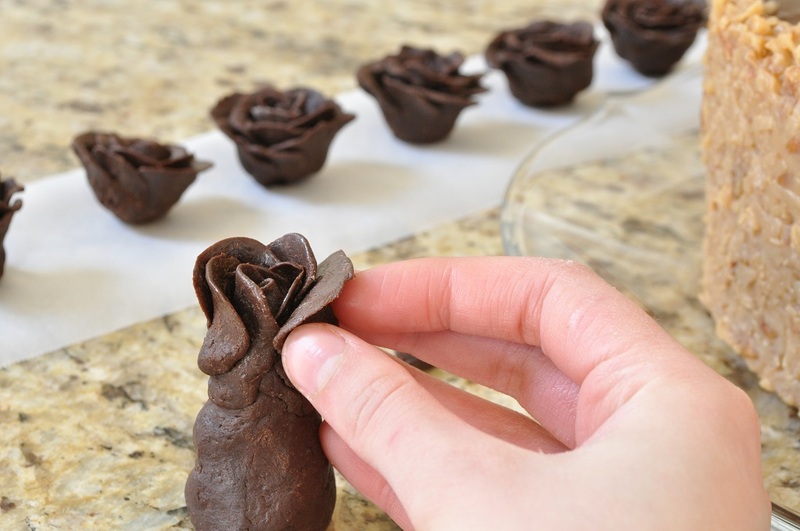 After you complete each rose, set it aside on a sheet of wax paper. 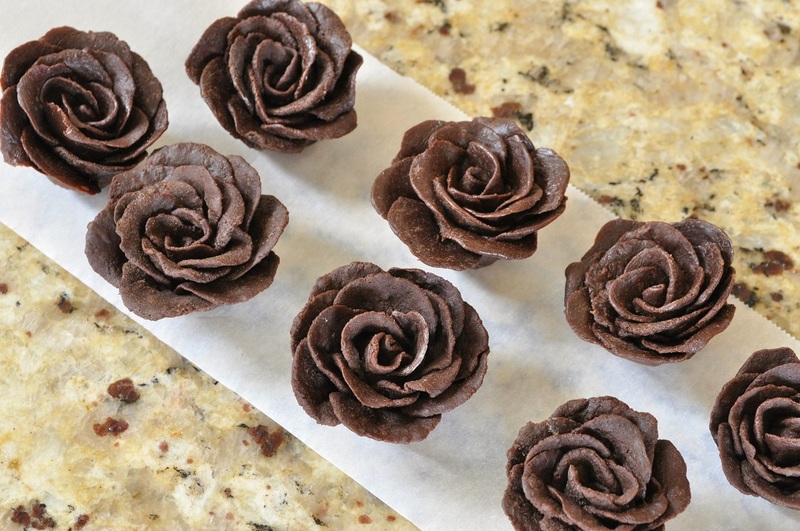 You should be able to get between eight and ten full-blown roses from this quantity of décor chocolate. 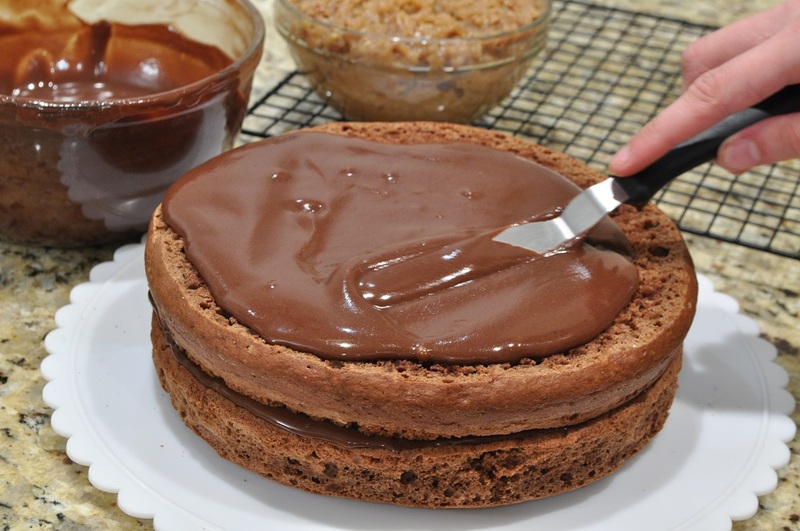 To assemble the cake, use a long, serrated knife to trim the top of each layer flat. Don’t forget to remove the parchment paper discs if they’re still on the cake layers! Sandwich the layers together with thin layers of the fudge icing. Spread a smooth layer of the icing over the top of the cake and crumbcoat the sides of the cake with a thin layer as well. 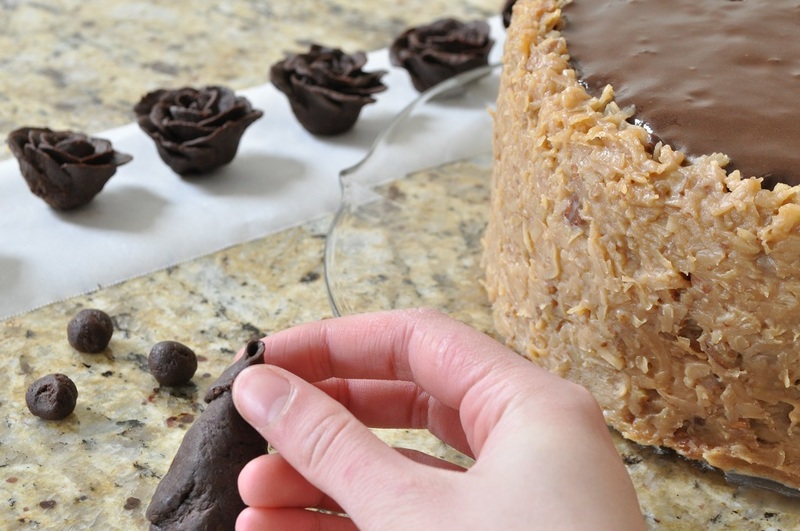 Place the frosted cake in the freezer for 15 or 20 minutes to harden the fudge icing. 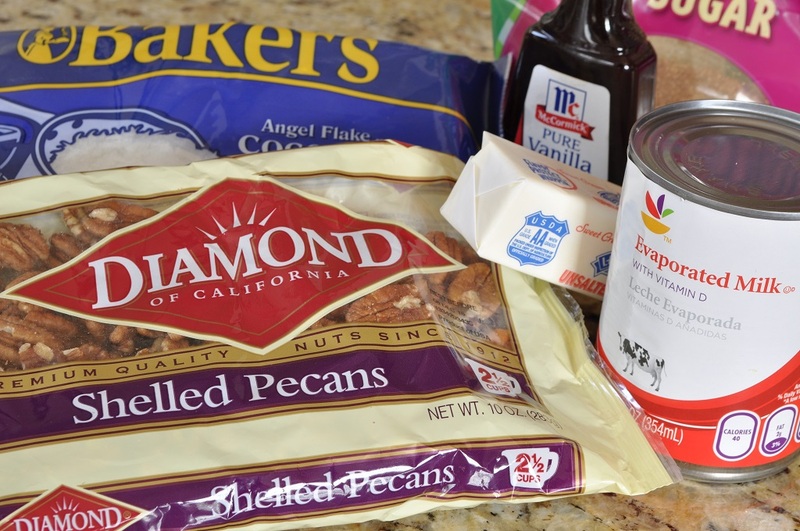 Remove the cake from the freezer and coat the sides with a generous layer of the coconut-pecan frosting. 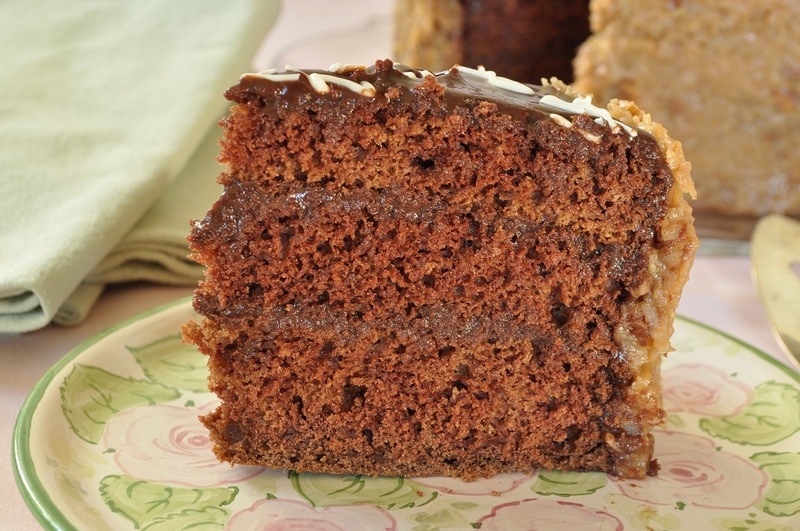 If you don’t want the bother of icing the sides of the cake twice, you could just skip the layer of fudge, go straight to the coconut-pecan frosting, and not have to bother with putting the cake in the freezer at all. 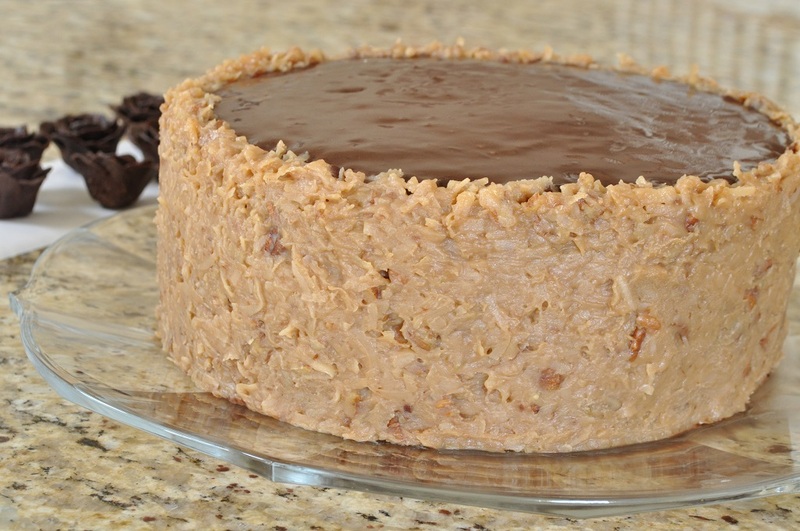 But I find that the end product looks much nicer if you have a nice smooth coat of fudge icing to spread the coconut-pecan frosting on. And besides, it means more fudge icing on each slice of cake, which can never be a bad thing. Arrange the roses and leaves you have prepared on the cake and use more melted white chocolate to pipe on a message and borders as desired. Eat and enjoy the fruit of all your labour! How clever you are to make and decorate a cake so gorgeous as this. 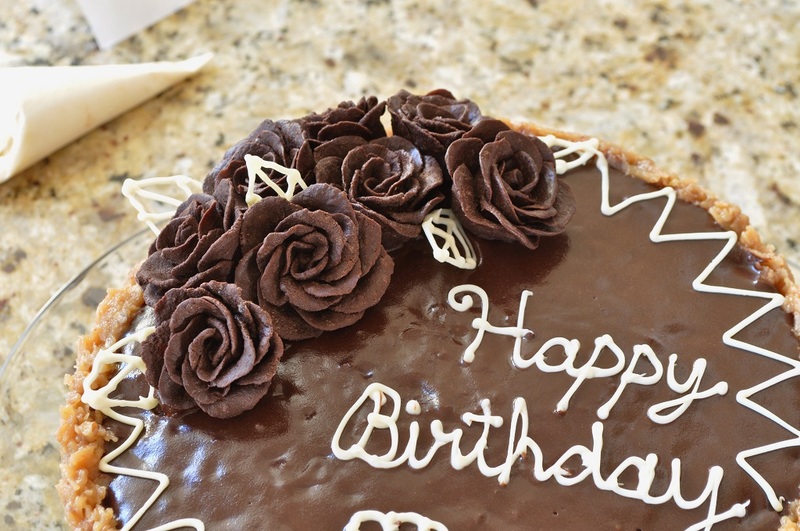 A brilliant tutorial for the roses too – I’ve always wanted to make my own roses for decorating cakes so I’ll definitely remember this when the time arises! Thank you so much, Laura. 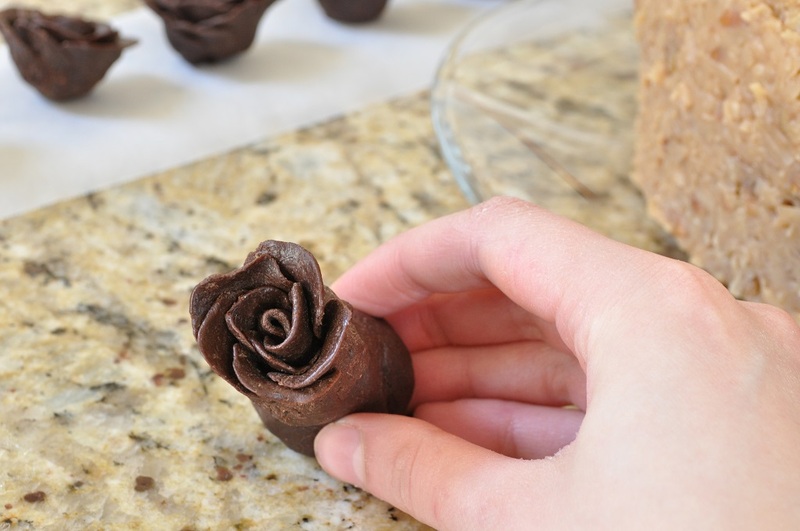 I love making décor chocolate roses–I could do it all day! It was a rewarding experience to get the process documented in photographs and words. That is one very amazing cake. It looks fabulous and I have a sneaking feeling it must taste sublime. Your mother must have been thrilled with it and to make it eggless for her too. As for the roses, they are really special. Thanks for submitting this beauty to We Should Cocoa. Thank you, Choclette. 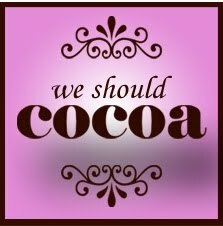 It’s always a pleasure to link up with We Should Cocoa and such fun to know that each month I’ll be making a least one fabulous chocolate recipe! What a fabulous cake. I’m really bad at all things decorative (I can’t pipe frosting neatly to save my life!) so I’m totally in awe of the roses and the beauty of the cake. Also, I would like a cup of that frosting and a spoon, please. Oh my! Decorating cakes seems to be my artistic knack. I like to think that my father’s talent for art has been passed along a generation, just in a different form–I can’t draw or paint a bit. You know what I fancy doing with the frosting? Chill it, cut it into squares, dip them in chocolate, and serve them as the most indulgent truffles you’ve ever tasted. I think I’ll try it next time. That looks incredible! I actually love making my own birthday cake – and I think this could go on a list of possible contenders. Thank you, Lucy. It’s so hard to choose just one cake per birthday, isn’t it? 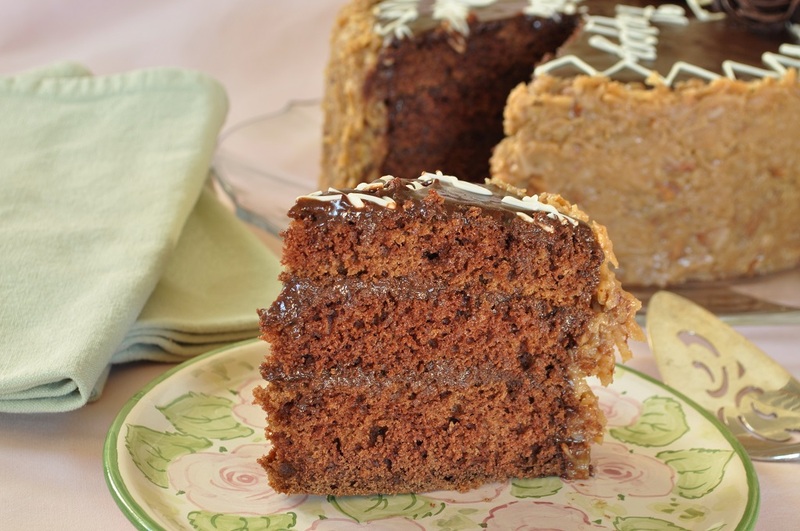 There are always multiple recipes on my list of possible contenders–too many cakes and not enough birthdays! This is such a beautiful cake! 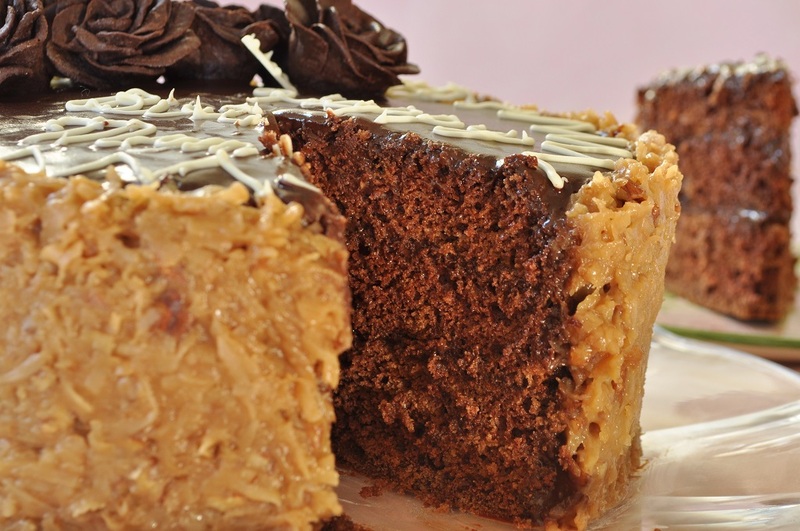 German Chocolate Cake is the supreme birthday cake around here, too; so thrilled to try the eggless version! “The supreme birthday cake.” Very well put! do i have to leave it overnight?? You do have to let the décor chocolate set for several hours at least, until it’s firm enough to mould. If you make it in the morning, the chocolate would probably be firm enough by the afternoon–just be sure to set it in a cool spot! I simply find it more convenient to do the chocolate the night before.